Distribution : Known throughout the tropical Indo-West Pacific. Mantle white with a bright orange or yellow-orange border and small purple spots all over. Each spot is surrounded by a ring of a much paler purple. The pale "washy purple" ring around each purple spot is very characteristic of this species. 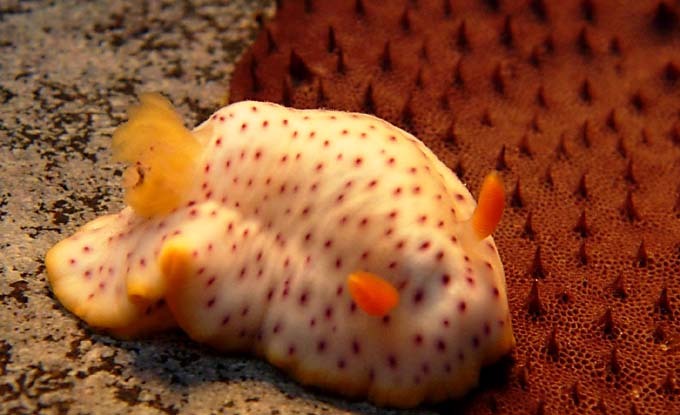 The rhinophore stalk is translucent, the club orange or yellow with a whitish tip. 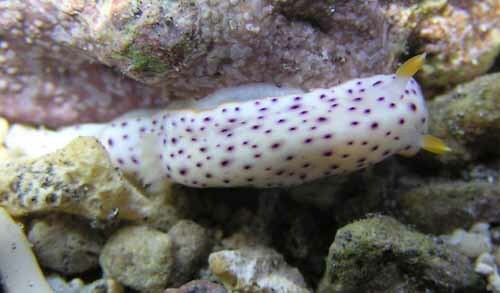 Several members of the family Chromodorididae have reddish or purplish spots on the mantle, but C. aspersa is the only species to have purple spots in combination with an orange marginal band. 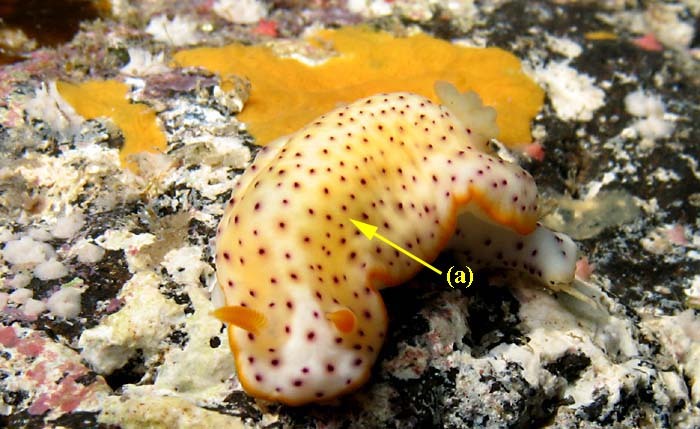 - In some specimens the mantle border and the rhinophores are distinctly yellow or orange and in others both are very pale yellow. 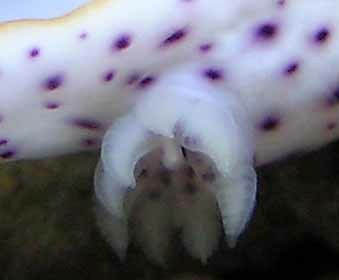 - In some larger specimens there are purple spots on the base of the gills. - Red Sea form : This differs in having much larger purple spots, which are slightly raised. Each spot does not have the characteristic faint purple ring although there is some diffuse purple pigment around it. 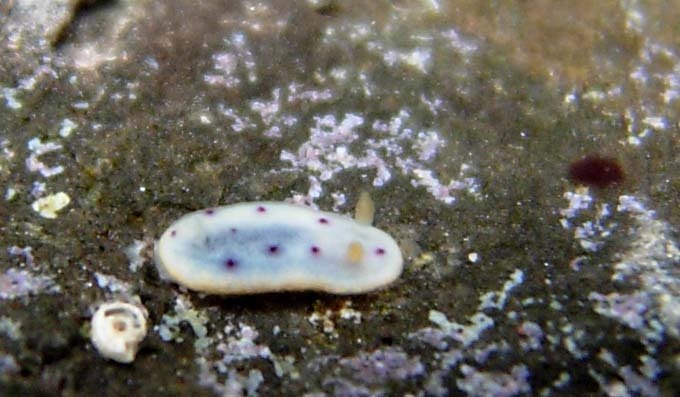 - Hawaiian Form : This form appears to be identical to typical west Pacific specimens with many small purple spots each surrounded by a watered purple ring but it differs in not having an orange or yellow border to the mantle. 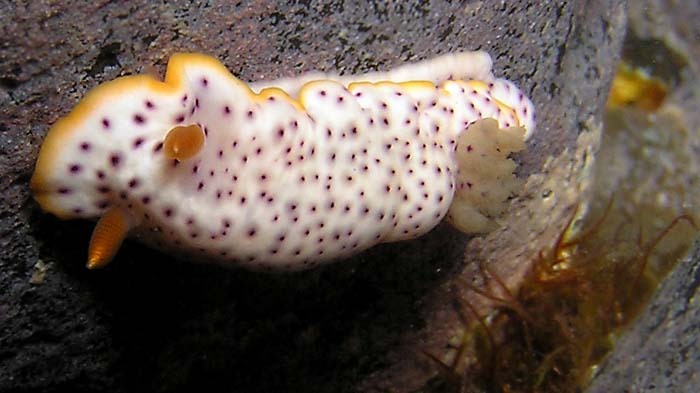 The body and foot are white with small purple spots, as on the mantle. Usually there is no colour border to the foot except sometimes a trace of orange on the posterior tip, but in some larger specimens there can be a washy yellow border to the foot deepens posteriorly to the same colour as the mantle border. According to Boucher (1983) and Johnson & Boucher (1983), this species lays a pale yellow spawn mass consisting of a tight coil of six whorls. The ova (75 µm diameter) occur individually within capsules (90 µm ). Extra-capsular yolk bodies are scattered between the capsules throughout the egg string and larvae hatch as free-swimming veligers. One specimen collected from Tamarin (Mauritius), 24 October 1985, size : 15 mm. Gould, A.A. (1852). United States Exploring Expedition during the years 1838-1842. Mollusca and Shells, 12 : 510 pp (with Atlas of Plates, 1856. Rudman, W.B. 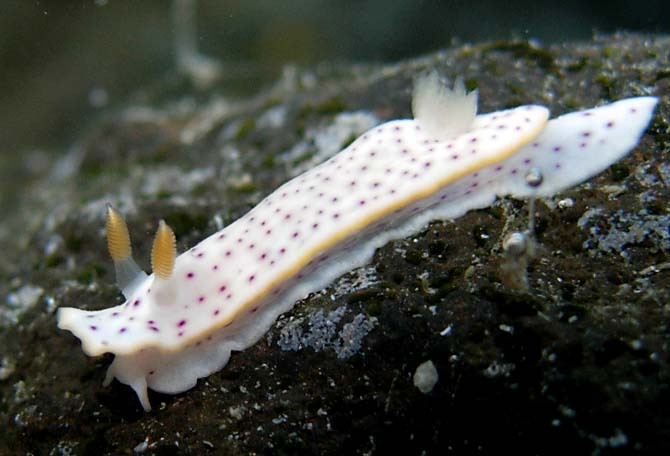 (1983) The Chromodorididae (Opisthobranchia: Mollusca) of the Indo-West Pacific: Chromodoris splendida, C. aspersa and Hypselodoris placida colour groups. Zoological Journal of the Linnean Society, 78 : 105-173. Purple spots on the base of the gills. Reunion, Etang salé on a rocky coast, 05 November 2006, size : 12 mm. 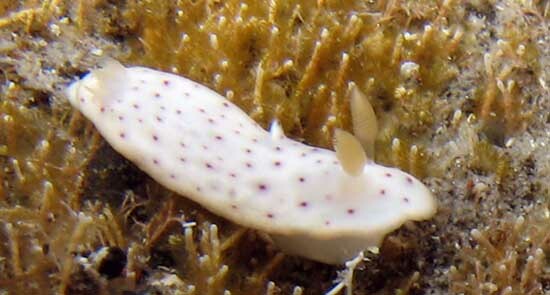 In this small specimen the mantle border and the rhinophores are very pale yellow. Reunion, 25 September 2004, in "'Etang Salé lagoon". Size : 20 to 30 mm. Reunion, Etang salé on a rocky coast, 20 September 2009, size : 25 mm. Reunion, Many specimens found in "Grand-Fond" (shallow water lagoon), "Mare de Baramine" and "Pointe de Baramine". Reunion, Etang salé lagoon, less 1 m, 9 November 2010, size : 15 mm.